Newton's Nook Designs: April Sneak Peeks and Giveaways Begin Early! This is our second post for today - to see Inky Paws #8 Challenge winners, scroll down or click here. Are you ready for a peek? 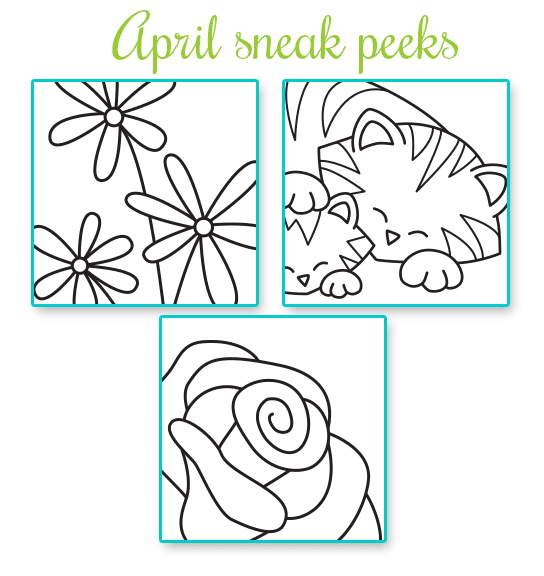 Another quick post today to give you sneak peeks of the three new sets for April. It's going to be such a fun week! Any guesses as to what these sets will contain? Hint: Mom will love these sets! Plus- We've decided to start the party early with a little giveaway! Use the rafflecopter widget below to enter! Can't wait to see the new stamp sets! Lovin' the flowers!! Can't wait to see the reveal!! I'm seeing flowers - and that means opportunity to practice my colouring! Excited to see the full release and the DT inspiration cards! Just wanted to leave a comment and say these look adorable! Also--for the giveaway--is there a way to enter if you are not on Facebook at all? Sorry - this one is geared towards Facebook followers. But we will be having more give-aways of our new sets. Just come back to the blog Tuesday - Thursday of this week and leave comments for a chance to win! More details will be posted tomorrow! The new sets look interesting! Looking forward to seeing more later this week! frߋm yoս! Βy the way, how can we communicate?